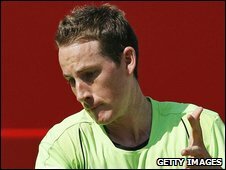 Richard Bloomfield has bowed out in the first round of the Open 13 in Marseille after losing to Simone Bolelli. The British number five held his serve in both sets, but was undone in two tie-breaks, losing 7-6 (7-5) 7-6 (7-1). Italy's Bolelli, who took world number one Rafael Nadal to three sets in Rotterdam last week, will now face Jo-Wilfried Tsonga or Andrey Golubev. Bloomfield, currently ranked 318th in the world, is hoping to recover from a disappointing season last year. He made the main draw without dropping a set in a qualifying campaign that included victory over George Bastl, who famously upset Pete Sampras in a five-set thriller at Wimbledon in 2002. Novak Djokovic and Gilles Simon, the world numbers three and eight respectively, are the top seeds for the event which reaches a finale on Sunday.